Defense Advanced Research Projects Agency (DARPA) central United States Department of Defense agency dedicated to advancing research in areas of science and technology that may directly enhance military effectiveness. 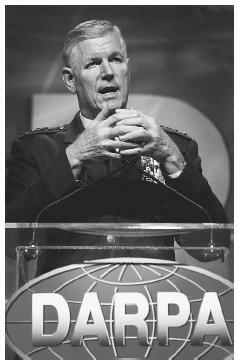 Air Force General Richard B. Myers, chairman of the Joint Chiefs of Staff, stresses the need for the different branches of the military, as well as the providers of weapons and technology, to work as a cohesive unit at a 2002 conference of the Defense Advanced Research Projects Agency (DARPA). contributed to the development of the Internet during the 1960s-1970s (then known as ARPANet). The launch of The Soviet satellite Sputnik in 1958 fueled the creation of DARPA. Eventually DARPA's programs related to utilization of space were transferred over to the National Aeronautics and Space Administration (NASA) or the National Reconnaissance Office (NRO). Currently, DARPA continues research in space programs related to rapid use of the near space environment. DARPAS space use programs include the Responsive Access, Small Cargo, Affordable Launch (RASCAL) program, Orbital Express program, and the Space Surveillance Telescope (SST) capable of detecting small satellites and other military hardware place in geosynchronous orbit. During the Cold War, DARPA placed emphasis on developing technology related to ballistic missile defense. In 1968, DARPA programs became the foundation for the Army Ballistic Missile Defense Agency (ABMDA). DARPA is specifically charged to maintain the technological superiority of U.S. military forces. Instead of funding projects based upon traditional criteria (i.e., expectations of anticipated results), DARPA strives for innovation in technology—including areas and projects with a low probability of success. This approach does not allow the direct development of technology but helps to prevent technological surprise by potential enemies. As much as a governmental agency is able, DARPA has embraced an entrepreneurial oversight approach that facilitates rapid project start-up and strives to keep projects from becoming entrenched in traditional research funding mires. In some cases, DARPA can operate outside of traditional Civil Service rules and procure material support for projects outside of Federal regulations related to funding, bidding, and acquisition. DARPA does not directly operate laboratories or facilities. DARPA is organized around a technology branch—a branch that encompasses DARPA's Defense Sciences Office, Information Processing Technology Office, and the Microsystems Technology Office—and system branch encompassing DARPA's Tactical Technology Office, Advanced Technology Office, Information Exploitation Office, Special Projects Office, and Information Awareness Office. DARPA also encourages research by offering and awarding monetary prizes. For example, DARPA decided to offer a substantial monetary prize to the winner of a race of fully autonomous, unmanned ground vehicles from Los Angeles to Las Vegas set for April 2004. For the Army and Marines, DARPA's project AGILE led to the development of the modern M-16 rifle. DARPA's HAVE BLUE and TACIT BLUE programs led to the development of the F-117 stealth fighter and B-2 stealth bomber used by the U.S. Air Force. Current DARPA programs seek to advance hypersonic flight capabilities. DARPA stealth programs include the SEA SHADOW program designed to apply stealth technology to naval vessels. As of 2003, DARPA emphasized research in counterterrorism, assured use of the near space environment, networked manned and unmanned systems, self-forming robust networks, technologies to detect and destroy elusive surface targets; remote sensing and characterization of underground structures, biotechnology, and cognitive computing capabilities (i.e., computing systems that have the ability to reason and learn). DARPA Offices and programs. May, 2003. < www.DARPA.mil > (May 10, 2003).